The FIWARE CKAN version has been extended with a set of plugins intended to provide a high integration with other FIWARE components. In particular, the Store Publisher plugin allows FIWARE users to offer their published datasets in the FIWARE Store, by enabling the creation of offerings directly from the CKAN interface. In this way, users do not need to go to a different system saving time and improving the usability. In order to create an offering using the CKAN interface, you must be logged in, so you can manage your published datasets. Once you have entered in CKAN, open the dataset you want to offer and click on the “Manage” button. The displayed view, allows you to perform some management tasks like updating the dataset info, updating the provided data, or removing the dataset. 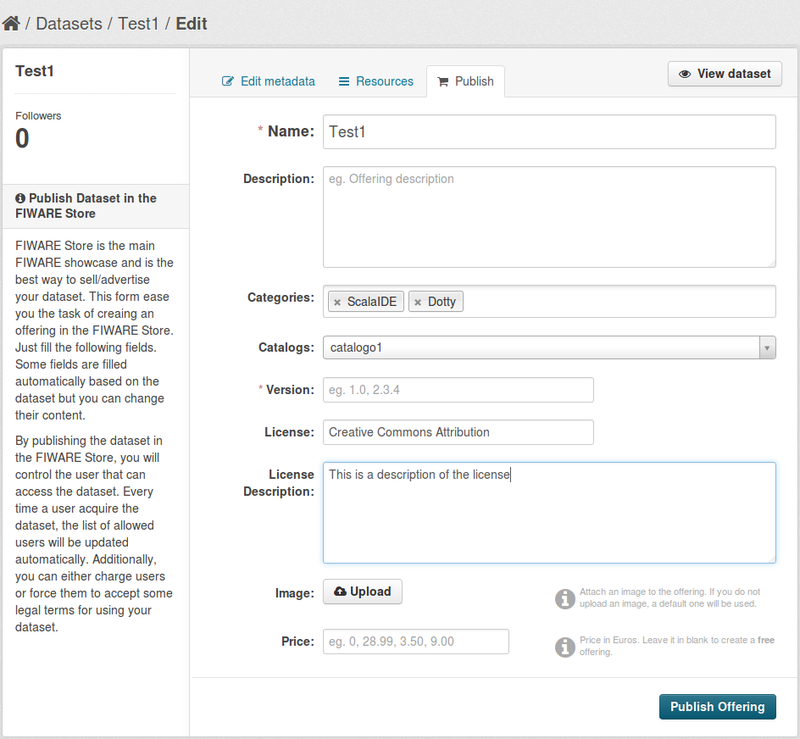 To publish your dataset in the FIWARE Store select the “Publish” tab. Note that you can use the “License” and “License Description” fields in order to include the terms and conditions for using the data. In this regard, if you include those fields, customers will need to explicitly accept them to be able to acquire the offering.